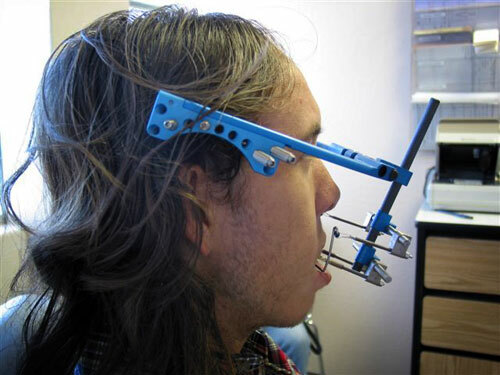 In most centers, external headframes are used for midface reconstruction with distraction osteogenesis. Headframes are attached to the skull with pins that penetrate the skin and are anchored to the skull. Extension rods attached to the headframe establish a place in front of the face from which traction can be applied. Attachment of the headframe to the segment of bone that is to be distracted is facilitated by an implanted rod that penetrates the mouth and gums to reach the upper jaw (see a visual of an external distraction device below). When the traction mechanism on the headframe is tightened, the segment of bone to be distracted is pulled forward. In general, this segment is surgically separated at the time the headframe is mounted. No traction is applied for the first five days following surgery. Once this latency period has passed, the device is tightened 1 mm per day until the desired amount of movement has been achieved. After the transport has been completed, the device is left in place to allow the bones to heal. The device must be left in place long enough for the newly formed bone to achieve enough mechanical strength to resist the forces of function.